One thing that has changed as I’ve turned from a gap year backpackers into a long term traveller is my sense of time and with it my pace on the road. This was my 2012….FAR too fast paced! At the beginning I was keen to experience as much as I could in the minimum amount of time. Part of it was pure excitement, part lack of experience, and part may even simply be down to wanting to be on par with those who seemed to have an opinion on everywhere and been on the road for years. 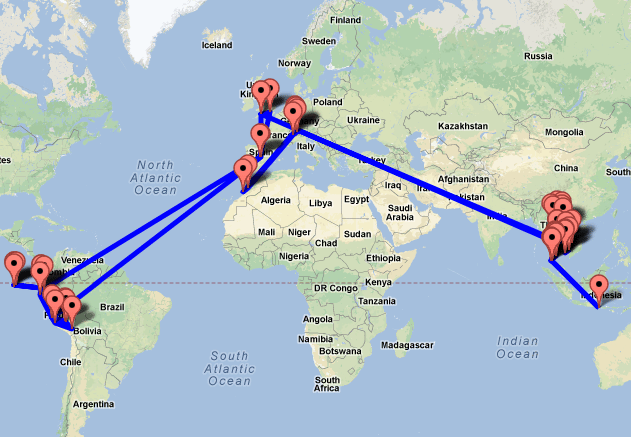 …and there’s a few reasons for my new outlook on travel. One of the biggest reasons if I’ve come to appreciate my time in a place. For me travel is no longer about frantically ticking off countries and experiences for the simply bragging rights. To be if you’ve spent a week in Thailand you can’t really say you’ve travelled there. I’m not being a backpacker snob – but honestly how much can you really experience in 2 weeks anywhere? 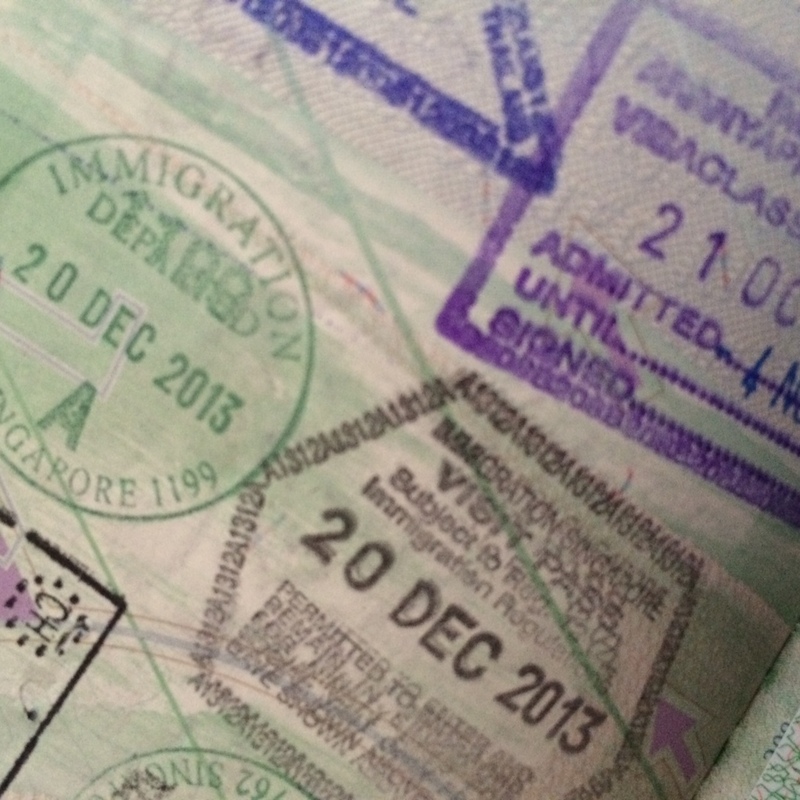 I’ve met so many people who spend a couple of days somewhere, get the stamp at the airport and BOOM – they’re the expert on that place. I hate those people, who – lets be honest – are usually the same ‘gap yah’ backpackers travelling on daddys credit card that we all loathe! I’ll fully admit that there are some places I’ve travelled too for only a short period that appear on the site – but I’ll never pretend to have properly travelled there, but there are some that I’ve spent solid amounts of time in (like Thailand, or Australia) that I know I can fully vouch for and I’ve experience ‘properly’. I’ve not explored everything that’s on offer – but I’ve given it a big enough chunk of time to lay claim to having travelled there! Now I prefer to spend a good chunk of time in a country, or even a single place and really get under the skin of a place. In my experience the longer you spend somewhere the more you get out of it. You learn the local spots, the hidden secrets, that little restaurant that does an amazing lunch time menu or that random bar that does an amazing happy hour at 4:15 on a Thursday arvo! Not only that but you meet more locals – and that’s always the best way to experience anywhere. The local experience will trump the tourist experience a millions times over. Sometimes Nothing Is The Best Option! One of the other big reasons – which I’ve touched on a few times on the blog – is ‘backpacker burnout’. Having entered my third continuous year of travel bouncing from place to place every few days is no longer a viable option, it’s simply not sustainable! It’s ok for a short burst, but after a while it looses it’s appeal and it’s a huge mental drain. By slowing down I keep the buzz of adventure – I still have things to look forward too and I get to enjoy life more. 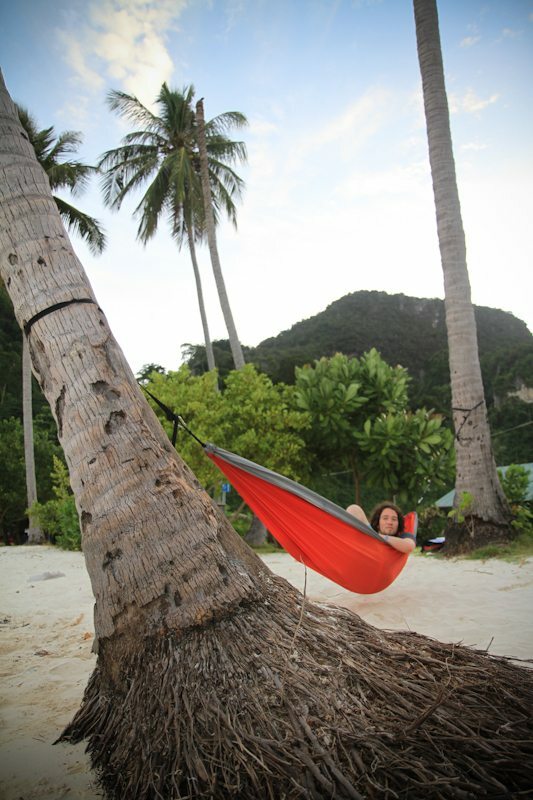 Some days I just want to laze around in a hammock, go nowhere, achieve nothing and simply wind down! There’s nothing wrong with that and it allows me to appreciate the days where I do something new. That’s why I spent 3 months back in Montanita, Ecuador again. It’s one of the reasons I’m now sat in Sagres, Portugal for the next couple of months. I want to unpack, relax and not have to worry about a huge chunk of overland travel, having to get a bus at 4am or pack my bag for yet another international flight. I get to unwind, enjoy the sunshine and spend some time relaxing in the company of like minded people. But don’t get me wrong – my passion for travel is still burning strong (despite the realisation of a few unmentioned costs of long term travel) and I’m keen to experience the unknown. Every few months I simply find myself getting the itch again – the craving of the new, the exciting and the unfamiliar. Travel is still very much a part of my day to day life. I relish the fact I get to basically live on holiday – juggling jobs like surf instructing and scuba diving to keep myself busy. I did this is 2 weeks – NOT a recommended time frame! But the whole fast paced, continuous movement, yeah that’s not really part of my thinking anymore. My advice to your guys….if you have the time, take it. Don’t rush your adventures. I get a lot of emails from readers asking me whether they can fit XXXX, XXXX, XXXX and XXXX into 4 weeks. In most cases yes, you could fit them all in – the bigger questions is though – do you really want to? Yes a packed itinerary in theory makes the most of your time in terms of stuff you see. But does it make the most of your time in terms of enjoyment? You’ll spend so much time on overnight buses and transport and flights that you’ll never really get the time to step back and enjoy where you are. You’ll probably loose 40% of your holiday simply to travel! And that’s definitely not what you want. Slow down, relax, enjoy what you see and really get to know a place. Are you a long term traveller, have you found you’ve slowed down over time? Definitely the way to go hey Rachel? On a lot of places I visited. And it’s hard to really fully experience a place for only a couple days … Or even an evening haha! I hate feeling burnt out after long journeys and feeling like I have to cram things in – glad I’m not the only one Danielle! Where are you heading to next? Haven’t had the opportunity really go abroad like some of you guys do yet but I can definitely agree with this this. As amazing as it is traveling can so stressful too even on a day to day basis. When I was in Egypt I couldn’t even plan full days because I just needed the afternoons to relax and refresh. Indeed relaxation time is the key – it is a holiday after all!hahaha! I hate a packed itinerary too. I would much rather really get to know a country and about the culture. Only spending a few days in one place isn’t nearly enough time! Indeed – I love spending some serious time in a destination and really getting to figure it out. Taking my time when traveling is not my greatest strength. But I can see the merit for sure. Jamie recently posted..What’s The Best Makeup Foundation? hahaha it can be a tough juggle hey Jamie? Great blog, this is exactly what I needed to find at the moment! I’m a month away from travelling solo and heading to Canada on a WHV. Just wondering, when you’re in countries without a WHV and get work, are they just cashies? Any info you could provide on funding your travels while on the road would be a great help! Enjoy Canada – haven’t made it there yet myself so let me know how you get on. Yeah in my experience you can grab some cash in hand on the road, not strictly legal though so make sure you know the risks involved. cheers James – glad you enjoyed it! Sounds like great advice. 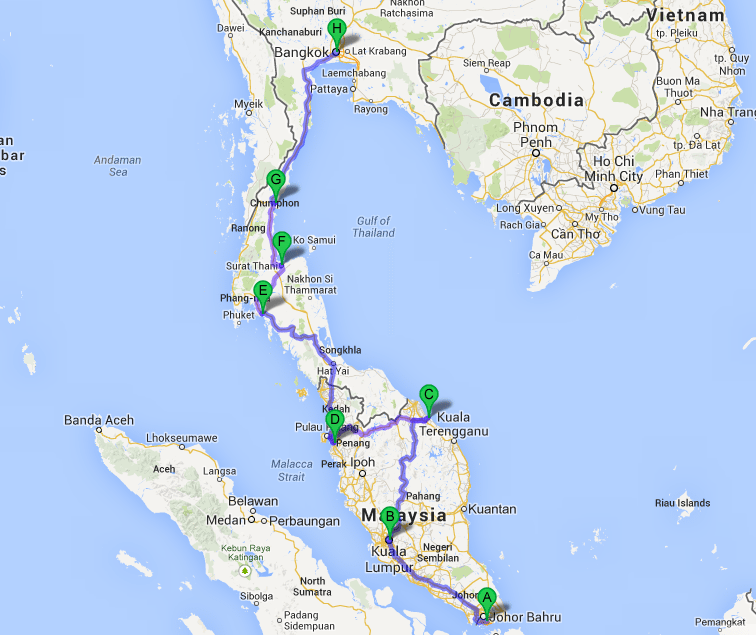 I’m planning a trip through southeast asia but I only have 7 weeks. Guess I can skip half of my itinerary after reading this ;). 7 weeks is a solid amount of time, where you heading? I don’t mind traveling more than a month. I will be satisfied, but not everyone wants to travel long-term. You don’t have to necessarily travel slow to have the full experience….not everyone can travel more than 2 weeks. Traveling longer doesn’t make you better. Come on now. Don’t be a travel snob. Hey Samantha, not trying to be a travel snob, but it was an article aimed at more long term travellers. Everyone can travel their own way and style and I respect that, but personally I feel a slow style achieves a lot more in terms of experience and being about to really appreciate each place.